Note: See previous installments in the Culinary Ambassadors Series here and here. I can’t remember exactly when I first stumbled across Taste of Beirut, but it only took a few minutes of browsing to know two things: one, that there needs to be more Lebanese food in my life, and two, that I need to visit Lebanon soon. If that’s not the mark of a great culinary ambassador, I don’t know what is. 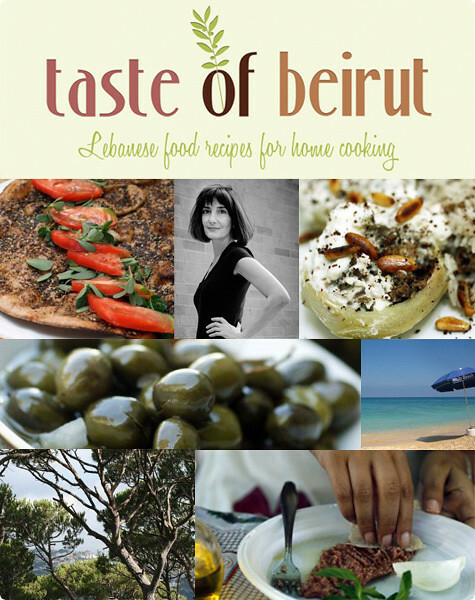 Taste of Beirut is written by Joumana, a Lebanese expat living in Dallas, Texas. Although she grew up in Beirut, she’s been living in the US for thirty-odd years, during which time she studied pastry arts, raised a couple of kids, and developed a soft spot for Tex-Mex food. Her blog, though, is Lebanese through and through. “My passion for my country of origin is unabated,” she says on her about page, and this is evident in everything she writes. For someone who has lived abroad for so long she retains not only an impressively vibrant connection to her roots, but an astounding depth of knowledge about Lebanese customs, traditions, and foodways. The other thing you can’t fail to notice about Joumana is how prolific she is. After more than two years of blogging she still churns out posts at a rate of four to five per week, all of them beautiful and fascinating and most of them including a recipe. I don’t know how she does it, but maybe I should ask for some tips! But about those recipes: even if you think you’re pretty familiar with Lebanese cuisine, I challenge you to spend ten minutes on Taste of Beirut and not have your horizons stretched beyond recognition. You will, of course, learn her take on the classics like tabbouleh, kibbe and baklava. You’ll learn the ins and outs of things like zaatar, man’ooshe and both fresh and aged labneh, pillars of the Lebanese diet that rarely show up on restaurant menus abroad. You’ll learn about obscure ingredients like amardeen and grape molasses, and find new ideas for using up that year-old jar of tahini in the back of your fridge. You’ll learn more versions of stuffed eggplants than you thought humanly possible. You’ll learn how to shake things up Lebanese-style by transforming old favorites into cutting–edge novelties. You’ll learn how to cure your own olives; heck, you’ll even learn how to make your own chewing gum! The most important thing you’ll learn, though, is that more things in life should be topped with garlic-yogurt sauce and fried nuts. My main deviation from Joumana’s recipe was to toast the bread instead of frying it, and to put it on the bottom instead of the top so it soaks up some of the delicious stew. Like this you have to eat it quickly, though, before things get too soggy; don’t even think about assembling it until everyone’s seated and waiting. A couple notes about ingredients: you want a good creamy, tangy yogurt for this—if your yogurt seems too runny you can thicken it up by draining it in a coffee filter for half an hour or so, or else use a mixture of Greek and regular. As for the bread, go for the thinnest you can find; if all you have is pita, heat it just until it puffs up, then split it lengthwise before brushing with oil and toasting each half to a crisp. p.s. Pomegranate molasses and tahini, in case you’re not familiar with them, are concentrated pomegranate juice and raw sesame paste respectively, and are available in any Middle Eastern market as well as many supermarkets. Serves: Four to six as a first course, as the main (or only) event let’s say two or three. It’s easily scaled up, though. Heat the olive oil in a large skillet over medium-high heat and fry the onion until golden. Add the meat (if using) and fry until well browned. Pour off excess fat, then add the cilantro and garlic and fry for a minute, just until you smell its fragrance wafting up. Add the spinach, pomegranate molasses (I put in a good glug), spices, salt, pepper and 1 cup of water and bring to a boil. Reduce the heat slightly and simmer about 20 minutes or until the mixture is juicy and thick and the meat, if using, is tender. Correct the seasoning. Meanwhile, prepare the other components. Heat the oven to 350F/175C. Brush the bread with olive oil on both sides and bake until crisp and golden. Cool, then break into pieces about the size of tortilla chips. In a small skillet, fry the nuts in the butter until golden. Drain on paper towels and set aside. Mash the garlic with a pinch of salt in a mortar and add to the yogurt. Add the tahini and additional salt to taste. On a large platter or individual plates spread out the crisped bread. Ladle the hot spinach stew on top, leaving bits of breading poking through here and there, and then top with the yogurt sauce and sprinkle with the nuts. Serve immediately, with forks and spoons. Great recipe! Be sure to check out http://shelflifeadvice.com to learn about the shelf life of foods, including many of the ones you included in this recipe. I recently discovered Joumana's blog and immediately felt inspired. I lived in the Middle East for many years and am always thrilled to discover sites devoted to what is one of my favorite cuisines–one that I write about frequently. The authenticity of her food makes it particularly special to me–that coupled with the stories! Thank you for featuring this. What a great blog! And a lovely recipe too. Thank you for introducing Joumana to us. Being Greek myself, I find so many interesting ideas for everyday food in Mediterranean blogs, as many of the ingredients are easy to find in my neck of the woods. 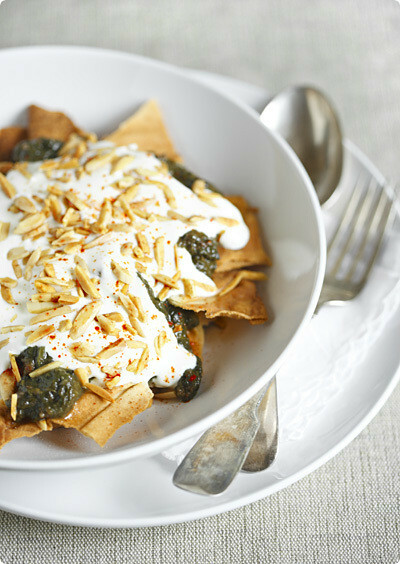 Your fatteh looks and probably tastes authentic. Joumana's blog is also great. Not only does she present lebanese food classics, she takes them a step further and gives them a modern twist! Joumana's blog is one of my favourites as well. And yes, she is incredibly prolific and incredibly inspiring! I must say though that I am a bit obsessed by Middle East food. Since when I bought my first themed cookbook a few years ago, tahini never lasts more than a month, my cumin never gets stale and somohow I always manage to find that the perfect finish for anything is yoghurt and garlic (and toasted pinenuts). It is just what I feel like cooking every day, maybe because for an Italian it is mostly familiar flavours and ingredients and textures, but with that extra twist to make it more interesting. Joumana is the first place to go for Lebanese food, she is a prodigious writer and cook and has some wonderful and unique recipes on her blog. . I've never tasted any Lebanese dish in my entire existence but these sure looks good. Thanks I've stumbled upon your blog and learned this recipe.